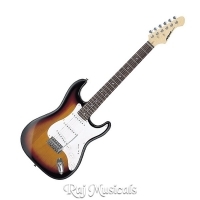 Aria STG-003 BK electric Guitar a high quality guitar for everyone. STG-Series really stand for it, with simple but rich specs at marvelous value. Aria STG-003 BK Electric Guitar. High quality guitars for everyone. That is Aria’s credo over 50 years of its history. STG-Series really stand for it, with simple but rich specs at marvelous value. Your sound is already there!